It’s no secret: education and planning tools help consumers make informed decisions about retirement and health savings accounts. And these valuable tools can lead to more customers and higher retention rates for you. Everyone wins. But a lack of resources—time, an in-house marketing team, you name it—can make it hard to plan and execute a consumer education strategy. So what can your financial organization do? Try these easy ways to educate consumers and share information about savings opportunities at your organization. Stashing a variety of lobby brochures in a specific area of your lobby or at teller stations is the best of both worlds: Consumers can easily grab information and you can draw attention to your products. Whether they’re looking for the new contribution limits, answers to FAQs, or curious about new savings opportunities, lobby brochures give consumers information they can use to evaluate their situations and start a conversation with your financial professionals. Does your lobby include screens? Put them to work too. Playing short videos, such as Ascensus’ Flashboards, can get clients thinking about retirement and health savings, learning about their options, and seeing how you can help. Topics could include HSA eligibility, Traditional vs. Roth IRAs, and naming a beneficiary (just to mention a few). Some consumers won’t set foot in your lobby, preferring to do business online when it’s convenient for them. Fortunately, much of the same material that lives in your lobby can find a home on your website. Here are some ways to educate and offer additional planning tools for online consumers. Upload lobby brochures in their electronic format. Host short videos to share information about specific topics related to your savings products. Post FAQs that help consumers take advantage of deductions, avoid penalties, and optimize savings. Add interactive tools like IRA and HSA eligibility calculators. Offer online account opening and maintenance. Or, put it all together for a one-stop shop. Retirement and health savings portals make retirement planning convenient by offering planning tools, news articles, and account management all in one place. If you mail paper statements, tuck IRA or HSA materials in the same envelope. For example, a statement stuffer like “Exploring Your IRA Options” makes consumers aware of how they can save for retirement with an IRA at your organization. Does your organization publish a newsletter? Include content related to IRA eligibility, the HSA triple tax advantage, or rollover rules (don’t forget to include direction on how to open new IRAs or HSAs). If you’re running short on time or the resources to create such content, consider purchasing articles that are already written and available for publication, like Ascensus’ ReadyContent. If you don’t have a consumer education strategy for 2019—or if you’re looking to take your existing plan to the next level—Ascensus can help. 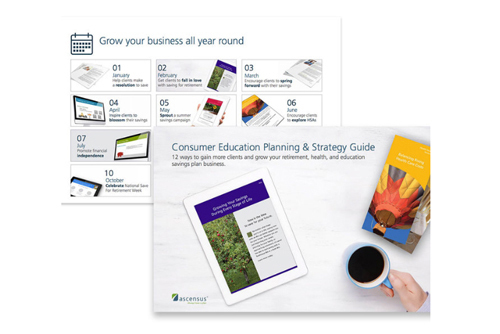 The Consumer Education Planning & Strategy Guide suggests ways to gain more clients and grow your retirement, health, and education savings plans for each month of the year. It features marketing ideas and related products to educate consumers and market your products—and it’s free. Reality Check: Are Your Plan Documents Up-To-Date?